The UK is voting on whether to leave the European Union on Thursday. Right now, polls show the “leave” and “remain” camps in a dead heat. If Brits do ultimately vote in favour of leaving, the consequences for investors could be severe: HSBC’s chief economist Simon Wells argues the near-term economic risks and market impact could including an immediate 15% drop in the pound against the dollar, with an initial fall for the euro too, and a global move to “risk-off,” meaning investors sell stocks in favour of bonds. But there’s another country that could feel the burn: Poland. The Central European country is currently on the edge of a banking crisis thanks to Swiss franc-denominated mortgages. Back in 2006 to 2008, the majority of mortgages that were issued by banks in Poland were denominated in the Swiss franc. And most of the outstanding stock of Swiss franc mortgages was issued in that period. But then things reversed course in 2009. 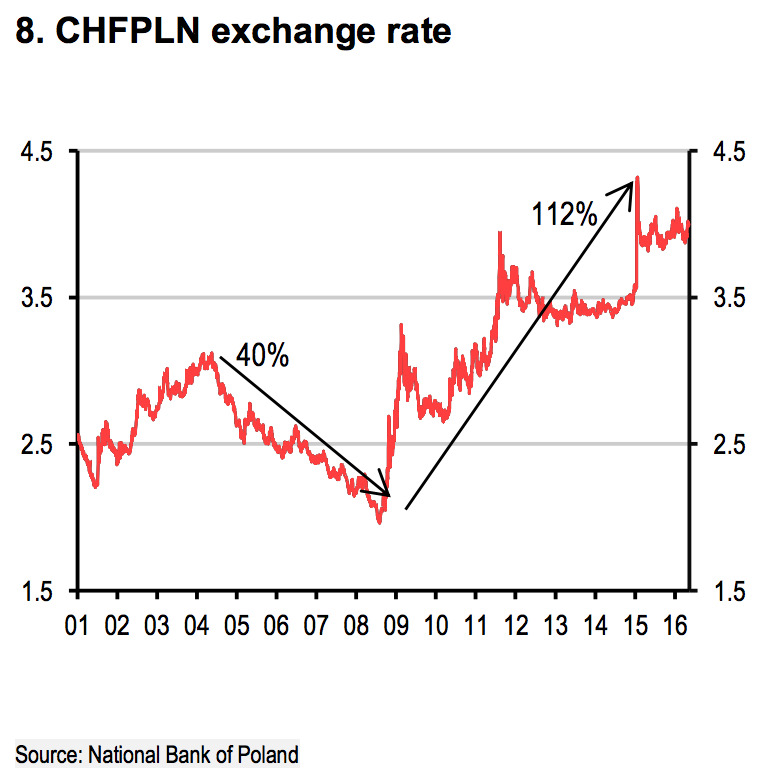 The Swiss franc has appreciated dramatically against the zloty since then – which you can see in the chart of the exchange rate. The government is now trying to put together a proposal for restructuring the Swiss franc mortgages. However, the latest draft’s details were pretty vague, and there was no mention of methods for spreading the cost of restructuring over time. The Polish president, Andrzej Duda, will reportedly draft legislation, which is expected to be presented by the end of June. In light of this situation, BMI Research team noted that Brexit could spell bad news. Should the UK vote to leave the EU, they believe that the Polish currency will depreciate sharply against the franc as investors retreat to safe havens. This, in turn, will increase the cost of the mortgage conversion plan and once again raise concerns about what the government will do. Notably, the zloty has depreciated by 6.0% against the Swiss franc since March. 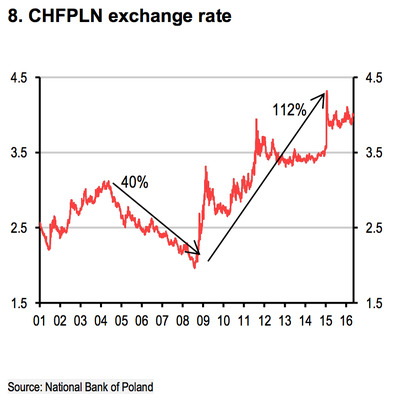 But the BMI team thinks that a Brexit could lead to the franc gaining another 9.0% against the Polish currency. In short, although it’s not the team’s base case scenario, a Brexit could create some problems for Poland and its banking sector.